We have launched this product in closed beta on 19th Nov '18. To signup for On-site Messaging, you need to get it enabled for your MoEngage account. To do so, reach out to your customer success manager or send an email to support@moengage.com with your account name. On the All Campaigns Page, search for campaign type - "On-site Messaging"
How to create an On-site Messaging Campaign? Before you start configuring the campaign, select the type of template you want to use which you can customize completely using our HTML Editor (available on Step-2 of campaign creation). These templates can be customized using our editor on Step-2 of campaign creation. In addition to the above templates, you can also upload your own templates and configure those further during campaign creation. 1. Campaign Name: Specify a unique campaign name which has a length between 5-50 characters. 2. Platforms: Specify the platforms between web and mobile web which you want to target for this on-site messaging campaign. 3. Select Trigger Action: Select the trigger action based on which the campaign will be triggered for your users. after the user has scrolled a page on your website by 40%. Custom Event: Choose this option if you want to trigger the message when the user executes a custom event you have tracked on MoEngage. Select a custom event which the user executes on your website. You can also specify additional attribute checks for trigger a message when user executes an event. For example. Trigger a message after the user has executed Purchase where "Brand" is "Brand1"
Exit Intent (Web Platform only): Choose this option if you want to trigger a message when the user is trying to exit your website. We detect exit intent by monitoring the pointer on the website. As soon as the pointer moves out of the browser window, we detect this action as an exit intent and show the campaigns which are created with Trigger Action : Exit Intent. All Users: Select this option if you want to target all users of your website via this campaign. This option also needs to be selected in case you want to deliver content to first time visitors. 1. Customize Template Template: We have used standard HTML editor to support Template customization in our campaign creation. Adding this class is very essential if you want the user to be able to close the template. MoEngage SDK will only close the template if this class is found. Adding this class is very essential for MoEngage to be able to track clicks and attribute this to a particular campaign. - For closing the template when the user clicks on a CTA or a link, add both the classes: moe-inapp-close and moe-inapp-click to the HTML template. This will ensure that the template is closed after the user is redirected to the URL. If you have a requirement to show the message only on certain web pages, you can define this in the Display Settings. We recommend you to test every new campaign on your destination URL so that you can ensure the look and feed of the template. By default test campaigns override Display Settings and Delivery Controls. 1. Campaign Timing - Define the campaign Start and End time of this campaign. Outside these bounds, the campaign will be inactive and will not be served to your website users. 2. Conversion Goals - Define the conversion goal for your campaigns which will help evaluate the performance of your campaigns. 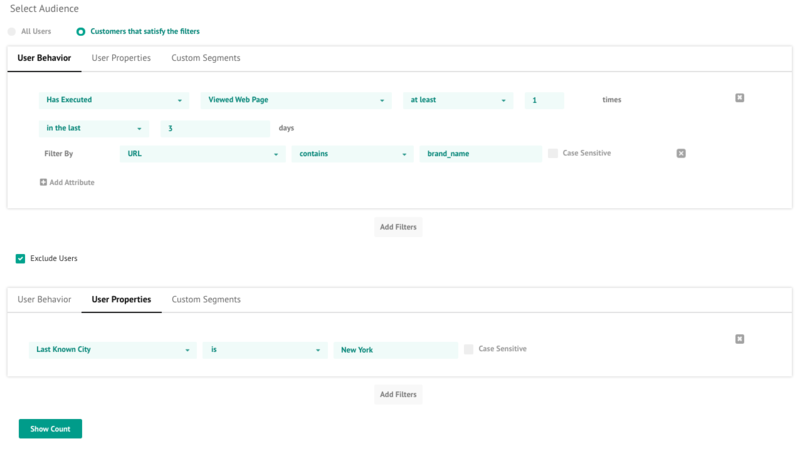 Conversion Tracking works in the same way as other campaign types on MoEngage dashboard. You can define up to 5 different conversion goals for a single campaign. 3. Campaign Priority - Define the priority of your campaign. This priority will be used in case there are multiple campaigns eligible for the same user. Delivery Controls are used to control the delivery of messages. It is important that restrictions are put while delivery on-site messaging so as to avoid spammy behavior which results in the same message being shown constantly to the same users. Minimum delay between 2 messages of this campaign - Define the minimum time within which the user will not be shown this message even if the user qualifies for the campaign segment and executes the trigger action. Ignore global delay between 2 On-site Messaging campaigns - Chose this option if you want this campaign to override the global delay restriction. Auto dismiss message after - Choose this option if you want the message to disappear automatically after 60 seconds. Turning OFF Delivery Controls will ensure that this campaign is shown every time the user is eligible for the campaign - falls in the segment, satisfies the display settings and executes the trigger action.